Well the latest set of employment data are out from the Hungarian Statistical Office. The real question is what to make of them. As I keep saying there are things about Hungary that puzzle me, and that I don't yet properly understand. It seems so different in important and significant ways from the other members of the EU 10. For what it is worth, Hungary's rate of unemployment is now running at 7.0% year on year. This is the figure of the May-July period, but it remains unchanged from the previous three-month period, according to the latest report from the Central Statistics Office (PDF). The KSH state that the number of unemployed in the May - July period was 296,700 and the number of employed 3.949 million. This latter number is a slight drop from the 3.943 m registered in April-June. At the same time the number of unemployed dropped by 5,800 from the previous 3-m period and remained largely unchanged year on year with the same period in 2006. The jobless rate for the 15-24 year old group, which represents 17.8% of all unemployed, was 16.8%, and this was down 1.7 percentage points from the same period last year. So what is happening here? Well basically Hungary is getting older, and the working age population is starting to fall, that's what seems to be happening. First off here is a graph which shows the actual numbers of unemployed people in Hungary since the start of 2006. Now lets take a look at the 15 - 64 age group, over the same period. As we can see, in general terms it is dropping steadily. 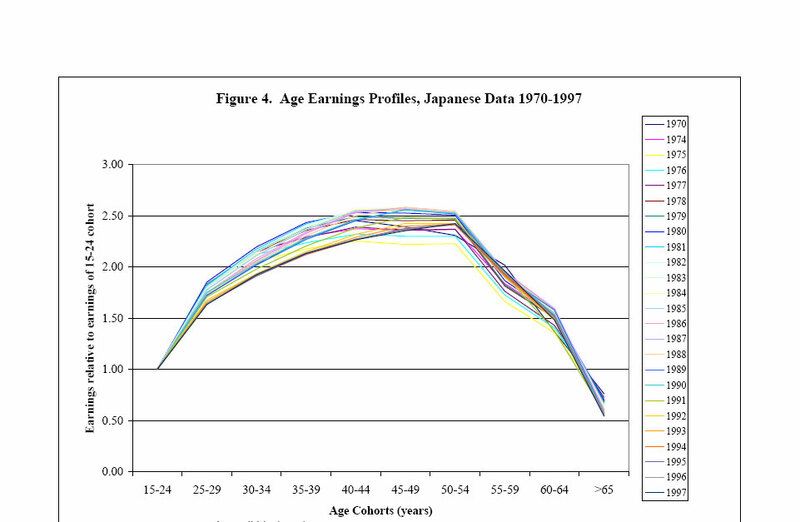 The employed population in this age group is fluctuating. It seems to have touched bottom in January/February 2007, and to be now increasing again. Given that the economy is slowing considerably while this employment expansion is taking place, one prima facie conclusion would be that productivity is not rising, and may well be slowing, since with more people working and more productivity the economy should accelerate, not slow. Of course one other possibility is that the average number of hours worked per capita is reducing - no overtime etc - and this is a possibility I will try and explore. When it comes to the age composition of the labour force we can also notice something interesting. Obviously the majority of the workforce are - at this point in time - in the productive age groups between 25 and 55. But it is also interesting to look at participation rates in the groups outside this age bracket, to see what is happening, and what the future has in stor. Below I have made a chart showing the numbers of people in the 65-74, 60-64 and 15-24 age groups. Now what is clear is that these two latter groups are expanding - this is what an ageing workforce means - while the latter, youngest group, is contracting. This contraction in the 15 to 24 age group can be for a number of reasons. In the first place it is simply a reflection of the fact that there are progressively less and less people in this age group, as can be seen in the next graph. But even of those who there are in this age group, given that Hungary wants to become a more modern, productive, economy, it is only to be expected that a growing percentage will seek to achieve a higher level of education and training, and this again is reflected in the graph below which show the participation rates for the three groups we are looking at. So what is apparent is that while the participation rate for the 15 - 24 group has been falling, the rate for the older groups has been rising steadily. This is only to be expected, since raising the participation rates of the the older groups is one of the only ways (outside immigration) that Hungary is going to be able to find extra labour force in the future, plus of course with the fiscal reductions there will be less available in the way of retirement pensions, so it will become normal that people have to work longer. So is all, in this case well, that ends well. Well not really, since there is productivity to think about here. It is not my intention to be ageist, but a person in the 65-74 group is not productively equivalent to a person in the 40 to 50 group, and this is the swap that countries like Hungary will soon be making. In conclusion I would like to mention the fact that Hungary might have something to learn from the case of Japan. In order to try and explain what I am getting at, here's a convenient graph of Japanese economic growth 1955 to 2003 prepared by US economist Michael Smitka from Japanese data available here. What is obvious from looking at this growth profile is that Japanese growth has been far from uniform over the last 50 years or so. This really shouldn't be so surprising when we think about economic theory a little. Key components of economic growth are the proportions of the total population working, and the kinds of activities they are engaged in. Now if we look at the early part of the graph we can see very high growth rates (which we can also find in eg China, and some parts of Eastern Europe - not Hungary unfortunately - right now). This is know as "catch up" growth, and is due in one part to an ever greater part of the total population becoming involved in economically productive activity, and in the other to a technological (productivity driven) 'catching up' process. As developing countries tend to start at some distance from the existing technological frontier then growth can be proportionately more rapid as they close the distance (again this process can be seen now across the Eastern European EU accession economies). However - and this is the important point for us here - with time this growth spurt eventually slows, although the loss is to some extent offset as societies generally move up the median age brackets (in the standard cases from median ages of around 30 to median ages in the 35 to 40 category, but this is exactly where Eastern Europe is so very different from the standard case) and by a growing importance of what have come to be known as 'prime age workers' (ie workers in the 35 to 50 age category, just where Hungary is now). 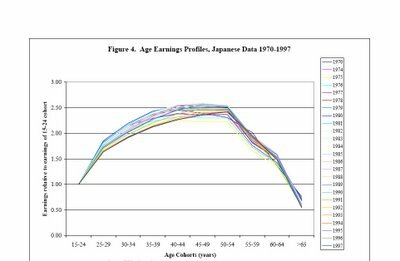 A reflection of this prime age wage/productivity effect can be seen in the chart below which shows how the age related earnings structure has altered in Japan over the years between 1970 and 1997. The most important point to note is that wages generally peak somewhere in the 50-54 age range (even though, as a result of the accelerated ageing process which has taken place there many workers in Japan now continue to work up to the age of 75and beyond). The point here is that this individual wage profile may be considered to be some sort of kind of proxy representation for what actually happens to productivity performance of an entire population as it ages. One very revealing detail is that while the shape of the hump has changed somewhat over the years there has been little noticeable drift to the right, which should give some indication of the extent of the age-related productivity problem. Indeed in Japan, as more and more workers have come to belong to the older age groups, aggregate wages at first stagnated, and have now begun to trend down. OK, this was just an initial exploration. There is no conclusion. Now we need to follow what happens and see how all this works out over time. There are a lot of theories about ageing knocking about all over the place. Now we are going to get to see what the reality actually is. This week the issue of credit ratings agencies has been in the news. The EU has (misguidedly in my view, at least at this delicate moment in time) been focusing attention on their role in the US sub-prime mortgage debacle. Nicolas Sarkozy also weighed in, and as if in response to the criticism, Fitch downgraded Latvian sovereign debt to BBB+. All this talk and movement around the ratings agencies in the current context raises deeper and, I feel, more important issues in the longer term. In particular, who is to take decisions about how to evaluate sustainability of sovereign indebtedness in the context of systematically ageing societies? Italy would be the case in point here. Only recently I drew attention to the issues which I felt were being raised by the impending changes in Italy's minimum retirement age legislation. In fact agreement among the "social parties" has now been reached, with Italian Premier Romano Prodi finally winning the support of Italy's labour unions for a much more gradual pace of increase in Italy's pension and retirement age. The agreement, it should be noted, is simply that, an agreement between parties, and it is not yet law. As such measures will now need to be brought before the Italian parliament, and presumeably this will take place in the context of the 2008 budget proposals. The new agreement is based on a staggered increase in the minimum retirement age, which is currently set at 57. The change in fact involves supplanting a previously agreed reform law - one which would have boosted the retirement age to 60 as early as next year - and an effective slowing down of the reform process. The law which it is proposed to put aside was in fact agreed to in 2004, by one of Silvio Berlusconi's governments, and the decision was to raise the minimum retirement age—from 57 to 60 - as of January 2008. Since that date is now fast approaching, pressure has evidently been mounting to repeal this part of the reform. One direct consequence of the new agreement - according to Labour Minister Cesare Damiano - will be the loss of some 10 billion euros in savings which would have been achieved under the existing legislation. Under the new plan the retirement age will now rise by one year, to 58, in 2008. In July 2009 the retirement age will again go up, this time to 60 for those with 35 years of contributions, or remain the same for those workers who can muster 36 years of pension payments. From 2011, the retirement age for everyone will rise to 60, and then to 61 by 2013. This decision, apart from being an astonishing one for outside observers, raises a number of important issues, especially since the ageing population problem is one which affects Italy in a very important way. Life expectancy in Italy has now risen to almost 80, and is among the highest in the EU. At the same time Italy currently has the third-lowest birth rate in the EU. Without raising the retirement age (and the economic growth rate), contributions simply won't keep pace with pension payments over the coming years, even assuming there is no further negative ageing impact on the overall economic growth rate, which is far from clear (and see the arguments in the German case here). The stark reality is that the combined level of both pension spending (about 15% of GDP) and public debt (107% of GDP in 2006) in Italy is the highest in the European Union, and the connection between the two is certainly not an incidental one. If the world's population does not look like rising or shrinking to unmanageable levels, surely governments can watch its progress with equanimity? Not quite. Adjusting to decline poses problems, which three areas of the world—central and eastern Europe, from Germany to Russia; the northern Mediterranean; and parts of East Asia, including Japan and South Korea—are already facing. Think of twentysomethings as a single workforce, the best educated there is. In Japan (see article), that workforce will shrink by a fifth in the next decade—a considerable loss of knowledge and skills. At the other end of the age spectrum, state pensions systems face difficulties now, when there are four people of working age to each retired person. By 2030, Japan and Italy will have only two per retiree; by 2050, the ratio will be three to two. An ageing, shrinking population poses problems in other, surprising ways. The Russian army has had to tighten up conscription because there are not enough young men around. In Japan, rural areas have borne the brunt of population decline, which is so bad that one village wants to give up and turn itself into an industrial-waste dump. The best way to ease the transition towards a smaller population would be to encourage people to work for longer, and remove the barriers that prevent them from doing so. State pension ages need raising. Mandatory retirement ages need to go. They're bad not just for society, which has to pay the pensions of perfectly capable people who have been put out to grass, but also for companies, which would do better to use performance, rather than age, as a criterion for employing people. Rigid salary structures in which pay rises with seniority (as in Japan) should also be replaced with more flexible ones. More immigration would ease labour shortages, though it would not stop the ageing of societies because the numbers required would be too vast. Policies to encourage women into the workplace, through better provisions for child care and parental leave, can also help redress the balance between workers and retirees. And of course all of this is just one more area where Italy is falling badly behind in its response. After the full implementation of this law Italians will still be able to retire before, say, either the French or the Germans. France's retirement age is currently 60, provided you have 40 years of contributions, but this is already programmed to rise to 41 contribution years in 2012, which compares with the 35 (or 36, depending) years of contributions currently required in Italy. Now Germany is arguably much more comparable to Italy in this area, since France is about 20 years behind (in a favourable sense) both these countries in the ageing game, and won't reach the levels of ageing (dependency ratios, median age etc) which currently exist in Germany or Italy till the mid 2020s at the earliest, but Germany is currently in the process of lifting the minimum retirement age to 67 from 65 in 2012. The point is, can Italy, with its well known low economic growth problem, afford all (or any) of this, and if she can't what may be the consequences? Well, as I have been noting on this blog, Italy already has an outstanding issue with the Credit Rating Agencies. Last summer two of the major agencies (Standard and Poor's and Fitch) cut Italy's credit rating, and at some point all of this will come up for review again. Italy needs to be very careful, 2007 may not be as simple as 2006, and people really shouldn't be taking these sort of risks, not when there are whole societies at stake they shouldn't. As central banks lose authority, might credit-rating agencies play the watchdog role? 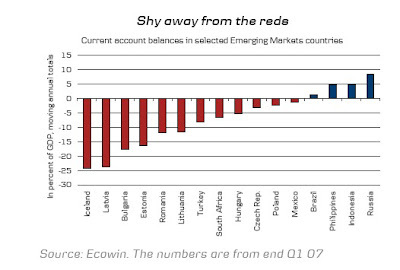 By acting swiftly to downgrade debt, they would constrain companies (and countries) from borrowing too much. But the agencies tend to lean with the wind, rather than against it. They upgrade debt when the economy is booming and downgrade it when recession strikes. If the central banks do eventually slam on the brakes, therefore, the rating agencies will only exacerbate the downturn. As asset ratings fall, investors will be forced to sell their holdings and credit will be withdrawn from the system. Thanks to the financial markets, central banks now struggle to police the economy. 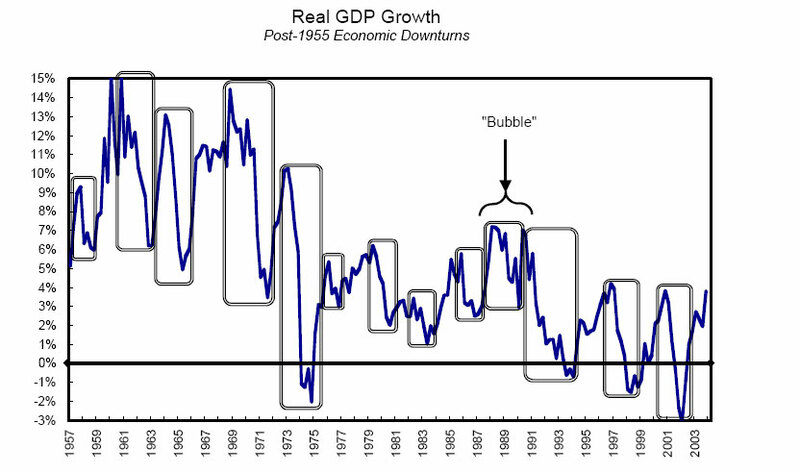 But this may imply that the bust, when it comes, is as hard to control as the boom that preceded it. The ECB has already effectively handed over the buck to the agencies here, since they decided back in 2005 that they will not in future accept government paper (bonds) from any country which has not maintained at least an A- rating from one or more of the principal debt assesment agencies. the questions being asked of the agencies are important because banks around the world have been filling their vaults with AAA-rated structured products ahead of international implementation of the Basel 2 regulations on bank capital. Under this new accord, a bank holding triple-A assets is allowed to keep less capital, enabling it to lend more. So banks have stocked up, especially on CDOs. If they were forced to sell securities that had been downgraded, liquidity could dry up. No one knows for sure what would happen to the value of the triple-A tranches in such a scenario. In this week's ratings downgrades, the highest-quality tranches of CDOs were unaffected. But the agencies are caught in a dilemma. They know that if the cherished triple-A rating is seen as devalued, it would undermine their credibility. Yet they earn so much revenue from CDOs that working with the banks and funds that structure them has proved irresistible. So we may see an under-reaction, followed by a subsequent over-reaction, and it is just this which may make events difficult to control. And then, if we go back to just last month, we may remember that the Italian government announced it was raising its deficit forecast for this year to 2.5 percent of GDP from 2.3 percent, in part in order to spend money to raise minimum pensions. The government also said it may need until 2011 to balance its budget, falling behind in the process on an EU-wide goal of doing this by 2010. This whole problem takes on even more importance when we take on board the fact that economic growth in Italy slowed substantially in the second quarter of 2007, according to provisional figures released on Friday by the National Statistics Institute ISTAT. In the April-June quarter gross domestic product increased by only 0.1 per cent, compared with the first quarter of 2007, when GDP grew by 0.3 per cent (see chart below). This is the slowest rate of growth recorded in the last 18 months. Projected growth for 2007 had already been revised down from 2.3 per cent based on the first quarter, to only 1.8 per cent at present. This number, apart from being far below the current European Union average of 2.6%, now looks like it may well need further downward revision as we move into the third quarter, and I think it is important to remember that the deficit expectations were based on the earlier, and not the current forecasts for 2007 growth. In fact an estimated 2 per cent growth for 2007 was used by the Italian government as the basis for its economic and financial planning document presented in June. The blueprint envisaged cutting budget deficits, as well as a gradual reduction of the national debt from the current 107 per cent of GDP to 100 per cent of GDP by 2010. Less growth will inevitably result in a smaller increase in revenue, and the Italian government now run the risk of yet more problems with the debt rating agencies. If this trend continues, it could create serious difficulties for the centre-left coalition led by Romano Prodi, the prime minister, for whom economic rigour, growth and a reduction of the huge national debt are primary goals. In general the picture had already been becoming reasonably clear from the Italian industrial output numbers we have been seeing, as well as from the retail sales data, and the consumer confidence readings. Which makes it even more astonishing that the government has been so complacent about the situation in recent months. 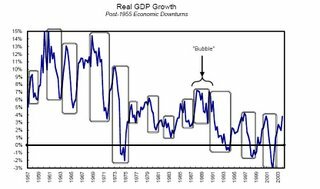 Indeed, if we look at the chart below showing year-on-year GDP growth rates by quarter, then one can easily form the impression that this cycle may well have peaked in the last quarter of 2007. 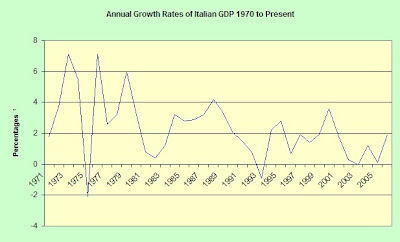 And if we look at the evolution of Italian GDP growth rates over a longer time period (see chart below) then it is clear that the situation is not a new one, since average growth rates for the Italian economy have been trending down for the last couple of decades, and it is a hopeless form of wishful thinking to imagine that things will change just like that, and just because you want them to. If the author of this blog is in any way right then the whole process is associated with the steady ageing of Italian society, and if this is the case then the issue will just not go away, and there will be some explaining to be done to the ratings agencies at some point in the not too distant future about just why it was thought to be convenient, only two weeks ago, to slow down the implementation of the retirement age reform. At the end of the day all of this now constitutes a slippery slope, and Italy is sliding. I can't hep feeling that if one day we reach some sort of post-mortem type "benefit of hindsight" evaluation of what it was that actually went wrong in Italy, then this recent retreat on the pensions front may come to be be seen as one of the last nails in the coffin. And the recent genuflection of the EU Commission towrads the credit rating agencies may be seen as one more example of really shooting yourself in the foot. I hope I am wrong, but this is the feeling I have. Basically, you can't simply let one comparatively good year (and I would stress the word comparatively here) deflect you from what you know has to be done. Neither can you ask people (in this case the ratings agencies) to do a job which you (The EU Commission, the ECB, are either unwilling or unable to do) and then start calling for an investigation into their activities when you don't like how they handle things. At least, you can do both of these things, butif you do, well really you can't exactly complain if people take your encouragement to be more strict seriously and if they eventually assess what you say not on the basis of your declared intentions but rather on the basis of your past actions.